A full-time job with low wages can push families to the edge of dangerous financial cliffs. We have the research to prove it. Simply being employed does not mean economic self-sufficiency for women in Colorado. In fact, it may actually work against them. Currently in Colorado, public assistance for the working poor isn’t designed to allow women the opportunity to incrementally increase their wages to work toward self-sufficiency. In fact, as a family’s earnings increase and they rise above the official poverty level, they begin to lose eligibility for tax credits, child care subsidies, health care coverage, and food stamps even though they are not yet self-sufficient. So although parents may be working and earning more, their families can’t reach financial security. This is called the Cliff Effect, and it results in many women refusing pay increases, forcing them to live a life of dependence. Starting in 2006, The Women’s Foundation of Colorado led a coalition combining public policy organizations with those providing direct services to the community. This coalition is the Women’s Family Action Network, and today they continue to collaborate on research and advocacy around the Cliff Effect and other issues related to raising women and their families out of poverty. After six years of strategic, dedicated work, The Women’s Foundation of Colorado was integral in passing the bipartisan Senate Bill 22 in 2012 in Colorado. Senate Bill 22 provides the opportunity for up to 10 Colorado counties to pilot the gradual reduction of childcare assistance, giving working poor women a greater chance of living without the need for public assistance. We're continuing to work on public policy issues to eliminate the Cliff Effect. Learn about our current legislative priorities. 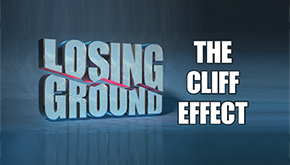 I-News Network at Rocky Mountain PBS presents an award-winning documentary about The Cliff Effect, a little-known snag in state and county law which can put some families in economic jeopardy if they accept a raise or promotion at work. Project funded by The Women’s Foundation of Colorado and Janet Mordecai.